I feel I have to tell you about my latest fishing outings. Everyone knows I love to fish. But almost as well known is the fact that I love to teach others to fish. I get a charge out of seeing their excitement as they pull in that first or forty fourth fish. Part of my aim is to see that they develop a lifelong passion for the sport and hopefully pass it on to someone else along the way. The first incident was when we were in the BWCA. My niece Alison, who loves to fish, had great success the first afternoon we were up there. She caught three walleye and a rock bass. The best fish came the next day when she landed her personal best, a 28" northern. When she pulled it in, my kids laughed as I went scrambling down a rock wall to see that it didn't get away. During the hook extraction I managed to cut myself a good one on the fish so was bleeding a bit too. It was chaotic fun, in the name of a big fish. But to me, I wanted to make sure she got a picture with it. It was a great moment. 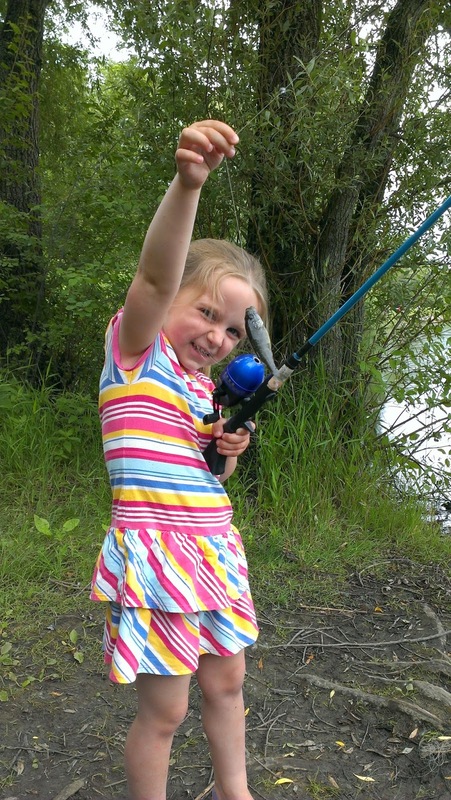 Like her dad, Alison loves to fish and is becoming quite accomplished at it. Over the weekend, each of the teens that were in our party also caught a northern. It was great to see everyone having success and working hard at it. There is nothing like seeing little kids get excited about fishing. I had the pleasure of teaching a couple of my friends' kids how to fish at the cabin in Mercer last year. Cohen had such a good time that I made a point to buy him a fishing rod for his birthday. That came with a retainer that I needed to take him fishing again. 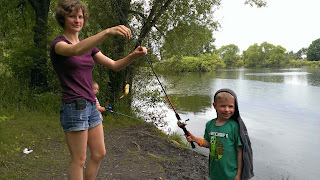 So, a couple of weeks ago, my daughter Sarah and I took him and his sister Tegan to a nearby pond for a day of fishing. It was really fun until we started hooking into the Bullheads. Now, if you know me, I've caught some pretty big fish in my day. I'll be honest that my heart sank when I saw them pull in a bullhead. They're like the spiders of the fish family for me. I hear they have "stingers" behind their gills or some such thing. So, my usual technique is to just cut the line on these fish. (They are "rough fish" which are technically a nuisance and should not be put back.). I changed my technique a bit as I grabbed the pliers. Then pinched the hook between the pliers and shook it like mad until the fish flew off the hook and back into the water. I'm sure my fishing buddies would laugh at the site, but hey, they don't have to know now, do they? Anyhow it was good fun fishing with the kids! Then, last weekend I went out with a friend who recently got a kayak. He's wanted to get better at fishing for quite a while, so I was happy to give him some hints. We went to my favorite lake because he wanted to learn where the hot spots were and try things out. He had some success and enjoyed the nice weather we were fortunate to have that day. The fact that he has invested in a kayak means he's serious. It gives me someone to go out fishing with and that's always a good thing. With all the digital distractions in the world today, I think it's so important to try and get kids outside and into the great outdoors. 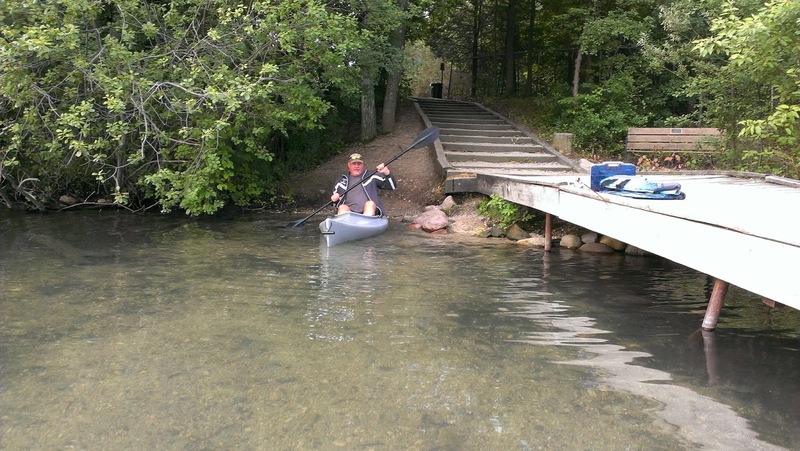 They are forced to make their own fun and usually, without even intending, they develop a love for fishing, camping and canoeing. My brother has a tagline on his email that reads, "Take a kid fishing today." To me, that's good advice.